Feeling frustrated with your kids’ lack of motivation? Tired of nagging and nagging? Looking for ways to inspire your kids to be the best they can be? Want to motivate your children without the use of force? Motivating Kids is the Parenting Book for you! Get the simplest, most practical guide to motivating children of all ages. Motivating Kids is your ultimate comprehensive guide to motivating kids. It includes practical tips that work effectively and easily on toddlers and teenagers alike. It will teach you the science and art of motivation: the Why, the What, and most importantly, the How to motivate your kids. We all know that motivated kids can do everything. Their drive and motivation will determine their success in life more than their knowledge, academic achievements and skills. Motivation is like a battery that keeps people going. The fuller the battery is, the further we can go. Motivation is what makes your kids get up in the morning. It makes them eat, take care of themselves, learn, try new things and experience the world to the fullest. It is like the fuel that keeps them going and, as a parent, you want them to go far. So if you want to make sure your kids go far in life, you want to make sure their motivation is strong. Motivating Kids is your ultimate guide to motivating your kids to be the best they can be. In contains over 300 pages full of practical ways to charge their battery and fuel their life. It includes 211 quotes to inspire you and your kids to do amazing things and be the best you can be: best parent, best child. In 18 chapters, this ultimate guide gives you 303 practical tips that will change your parenting and help you become a role model for your children. This practical parenting book has 28 exercises that will lead you to better parenting gradually and confidently. It will reveal to you the “how to” of motivation. Motivating Kids is a summary of 17 parenting sessions. It includes new research and statistics that will show you the science of motivation and save you sitting through courses, classes and hundreds of parenting books. It also offers three motivational stories that can be used with your kids to give them the motivation messages without force or need for discipline. 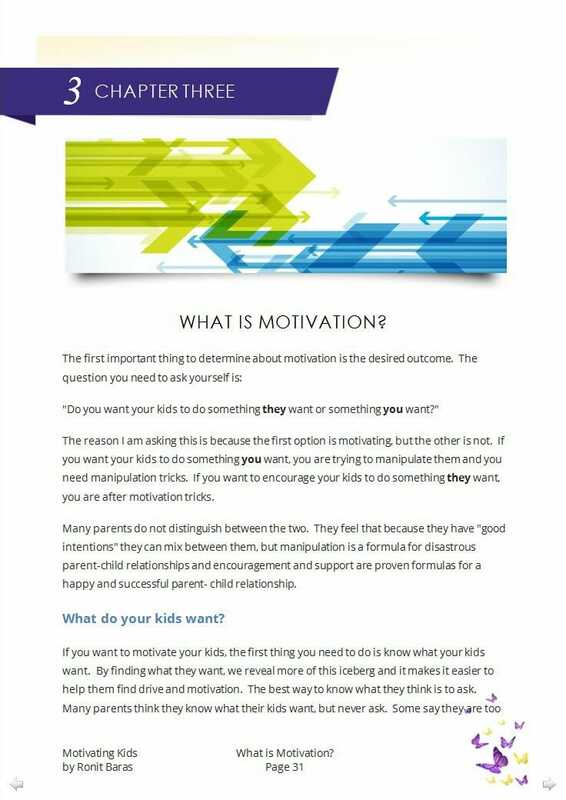 This ultimate, comprehensive guide to motivating kids, will teach you the science of motivation. The why? The what? And most importantly, the how to motivate your kids. How to coach your children to be the best they can be. Why fear functions as a motivation inhibitor. Practical ways to eliminate fear in your child’s life. How planning and effective time management can become motivation tools. How can you strengthen your child’s motivation. How can you use your kids’ natural desire to connect and belong as motivation tools. How to distinguish between healthy and non-healthy competition and use it effectively to motivate your children and turn them into team players. Making the change from nagging to encouragement and successful motivation. Alternatives to bribing, punishing or threatening children. What you can do to build trust in your relationship with your children. 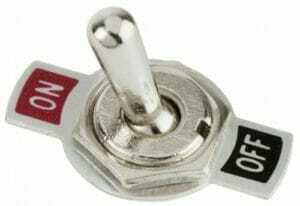 Why motivation requires you to adopt the open door policy. How to use quotes as a motivation tool. How to make sure that motivation will be sustainable. Does parenting feel hard? Feel like sometimes you are banging your head against a wall? It could be that the techniques you once thought were effective in raising children are actually part of the problem. Ronit Baras gives us the parenting bible we all wished we'd had - Motivating Kids! We often wish our children would "just listen, or "do as I say", but it turns out the best lessons come from direct experiencing supported by those that love us. My parents would often say, "I don't want my kids to go through what I went through", but if we think about it a little, this statement is counter-productive. Their experiences - what they went through - is what made them the people they are today. What they really mean is, "I want it to be easier for my kids", and it can be when you have the right tools to support them. Ronit, in her book, gives us these tools! Ronit's style of writing is both personal, experiential and simply enlightening. Her unique book teaches the benefits of being an authoritative rather than authoritarian parent. Is "the disciplinarian" really how you want your kids to remember you? 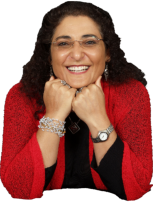 In Motivating Kids, Ronit teaches us that motivating children means letting go of "golden oldies" like "discipline", "fear", "rewards" and "punishments" and focusing on "empowerment", "confidence", "cooperation" and "approval". It also outlines the importance of your own positive self-regard and confidence in the growth of your kids. Modelling forms an important part of your child's learning and this book helps you make sure you get that right! Most importantly, it focuses on trust and how this is so important in a parent-child relationship if you want children to achieve and be self-motivators! As a teacher, I use many of the techniques in this book with my students and as a parent, I do the same! 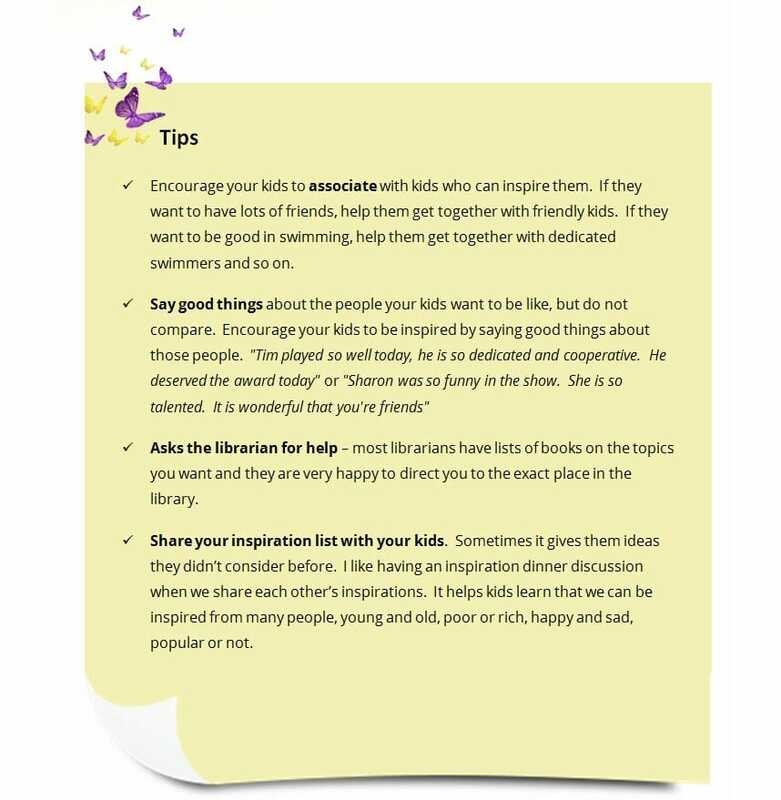 Ronit has provided trigger questions and subheadings for easy access and step by step instructions to ensure you maximize your children's motivation. This book is a must for anyone who wants their children to grow into positively self-regulating and motivating human beings! 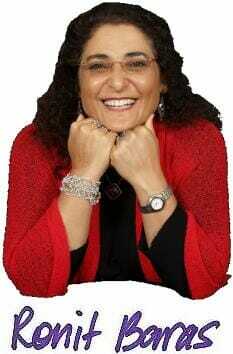 Ronit is the founder and director of Be Happy in LIFE. She is teaching at the University of Queensland and a trainer for the institute of public administrators (IPAA) Queensland, is the State Director of Together for Humanity Foundation, was the school’s program director of the Global Learning Centre and has conducted many relationship and parenting workshops around the world. Through her presentations and writing Ronit delivers inspiring messages of love, respect, acceptance, motivation and determination. Ronit has helped many parents around the world establish great relationships with their kids and discover the joys of successful and mindful parenting. She has been teaching, coaching, presenting and writing over 28 years and her educational writing has appeared in educational magazines around the world. Her blog Family Matters is a great practical resource for parents and teachers, already containing over 1500 articles on personal development, education, relationships, family life and parenting. 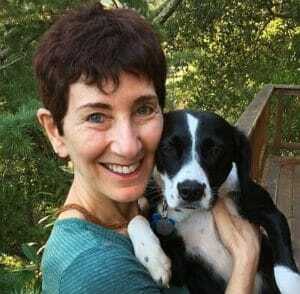 With her writing, she has touched the lives of millions of readers from around the world. Ronit thinks that people can (and should) live a happy life by learning basic emotional skills to manage their feelings and actions and to take charge of their life and that parents are best to pass on those skills to their children. Parents are very important agents of their children’s identity. To support their kids’ development, they need to be able to support themselves and have basic motivation skills. Parenting requires high emotional intelligence, which is the key to success in life. If we want to raise a generation of happy and motivated kids we need to focus on teaching them happiness and motivation. Luckily, happiness and motivation can be developed. They are the key for opening the doors to endless possibilities. Many times, I hear the question “How do you motivate kids to do things?” Most parents in the world would like to know the “magic tricks” of motivating their kids to succeed, to be friendly, healthy and happy. Part of having kids is the desire for them to be “in the zone,” where everything is easy and fun. In this sense, kids and their parents are exactly the same. Kids need motivation and parents need motivation. Motivation has no age and this gentle parenting book will cater to both parents and kids. 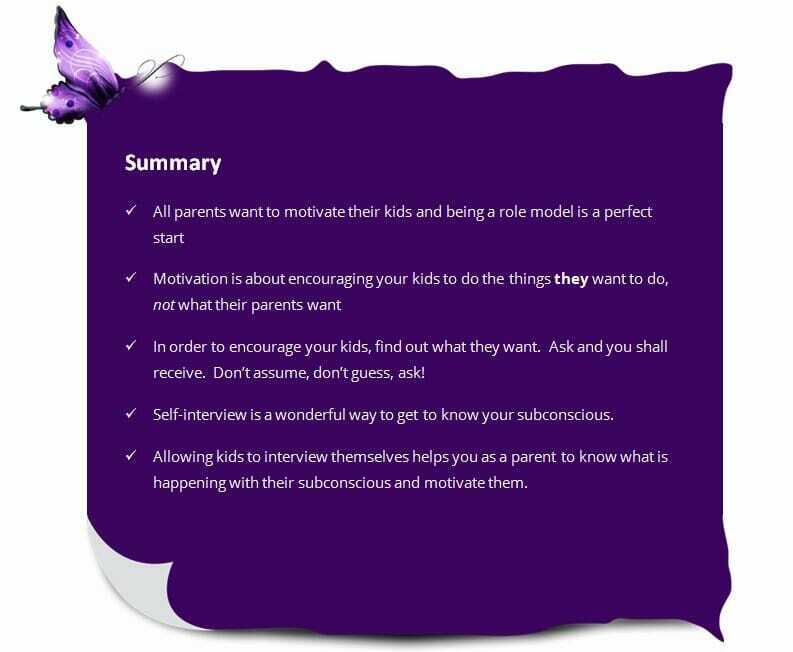 In this parenting guide, I will share with you all there is to know about motivating your kids. This ultimate guide to motivation is based on 28 years of education experience and practical work around the world with parents, teachers and kids of all ages. I have perfected this tool kit over the years by researching its effectiveness with parents, kids and readers. I am happy and delighted to share them with you as well. 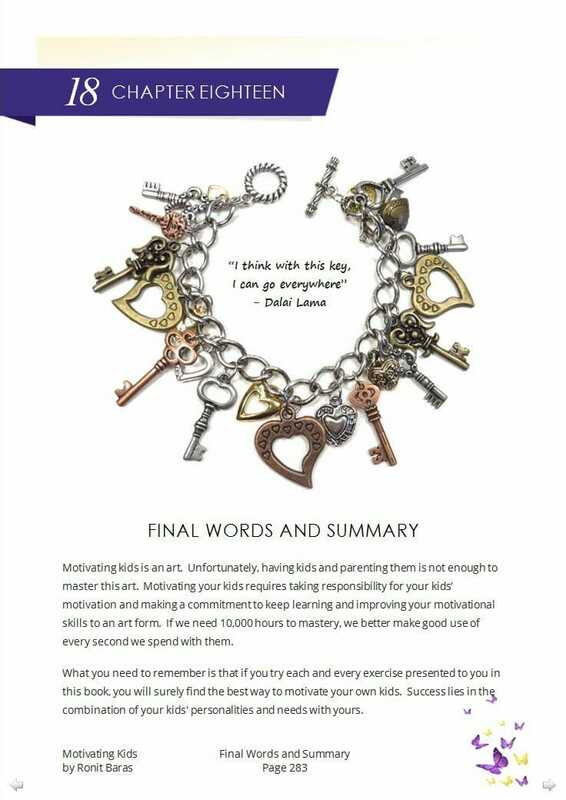 In various chapters, I cover all aspects of motivation and how you, as a parent, can use each and every one of them to give your kids what you have always wanted – motivate them to be the best they can be. During many years of work, coaching and seeing thousands of parents and children, I realized that reading/hearing about motivation is not enough. We all read a great book, say, “Tomorrow, I will do things differently”, and after three days we go back to old habits. I don’t want this eBook to be another one of those wonderful positive parenting books that slip out of the mind three days later. I value theory and research but they don’t stand the tests of reality. People understand things pretty quickly, but they are always left with “OK, what do I do with this new knowledge and how do I do it?” which only increases the feeling of frustration and inadequacy. They know what they don’t know and can’t do anything about it. This is why I made the decision early in my career that action and practical tools are much more powerful than just theory. Because of this I have dedicated much of my energy to build a tool kit that my clients can actually use to get what they want. This eBook is not only about the “Why” but also the “How to” and in the most simple way. I wanted every parent to be able to implement those techniques in a very easy way without having to go through a degree, studying psychology or education. I have included tips and practical tools that when you try them, you are guaranteed to get results. Over the years, I have had clients, readers and fans raving about this approach. The night after a parenting workshop, many parents have sent me an email saying, “I am shocked. I got home and it worked straight away”, and many readers have sent me emails to share their successful use of those tips and tools. I promise it will do the same for you. This eBook is a conclusion of my life work about motivating kids. I run seminars and workshops teaching those techniques and strategies and have numerous success stories of 28 years of work. This ultimate guide is a summary of 17 parenting sessions, which I have summarized in 17 chapters for your convenience. I wish you an exciting, and practical reading and I hope you’ll make a good use of this new knowledge to motivate yourself and your own kids. Remember, happy parents raise happy kids and you are the best person to be your child’s motivator. When parents think about their vision of their children's future, it often includes some variation of the parent's own definition of "success". So when parents say that their children "lack motivation", it may be because the parent is pushing the child in a direction that doesn't match where the child wishes to go. 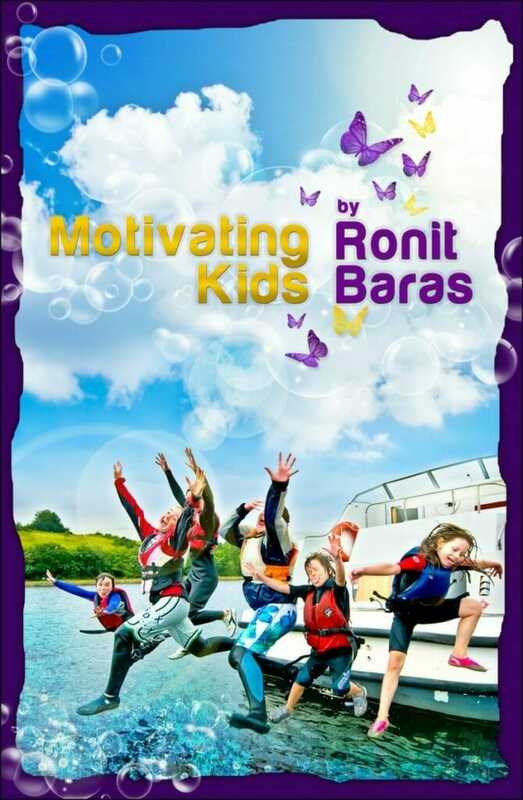 Ronit Baras has written a wonderful new book, Motivating Kids. 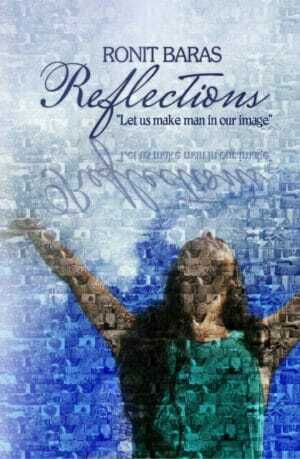 It is filled with warmth, wisdom and emotional intelligence skill-building tools. Motivating Kids helps parents become motivating coaches whose #1 goal is to help the child do the things they want to do, not what the parents want. After all, who's life is it anyway?